After tunnels, bridges and viaducts are the second-most expensive line-item in the most of the various proposals for Australian high-speed rail. Here we will provide estimates for cost-per-kilometre of standard bridge types, as well as rail-specific cost-functions for major bridges that require unique specification. Soon after starting this blog when I began looking into bridge costs, I got a little carried away and for a few months spent a substantial portion of my free time developing a set of cost functions for different bridge types based on empirical construction cost data from 285 worldwide bridges. The cost functions are of the form Cost = AeBS, where A and B are constants and S is the main span of the bridge in metres. The resultant exponential cost functions were in 2013 US dollars per road lane-metre. To convert to 2013 Australian dollars per track-metre, we multiply the base of each cost function by the 2013 exchange rate (0.965 – yes, we were above parity at the start of last year! 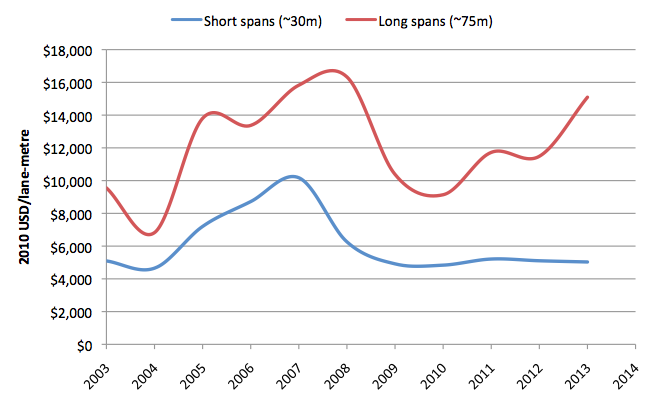 ), and a load factor for rail versus road (1.5). The cost functions (modified for rail) are tabled below, as well as a cost per route-kilometre for dual-track HSR at a typical span, to allow comparative evaluation against the AECOM13 data. Compare this to the AECOM13 data. Even if we applied a regional multiplier of 1.35 due to higher construction costs in Australia, then doubled it, AECOM is still more expensive. That’s a contingency factor of 270%. Compared to the real world data in the survey of 285 bridges, AECOM13 is right at the upper end of the range; only two beam bridges in the survey were more expensive. To put it in perspective, the cost per kilometre of the 1995-built, cable-stayed ANZAC Bridge in Sydney – for all eight lanes – was $211 million ($336m in 2013). And its main span is 345 metres, far longer than anything considered in AECOM13. AECOM13 is basically saying a track of HSR requires the same size bridge as five lanes of highway. And that is not credible whatever way you look at it; even the most conservative estimate (from Spanish HSR standards) puts the load factor for HSR at only 2.35x highway loading; Hot Rails will agree with the EC Harris study of UK bridges, which indicated a 1.5x load factor. The one bridge type not considered by the cost function is the box culvert bridge. Such “bridges” are typically better considered as drainage and included under General Civil Works. However, they are often used to cross flat, intermittently inundated floodplains, or marshy ground, where the depth is minimal but the potential length of affected floodplain is great. One method would be to simply consider the box culvert as a beam bridge with very small span (perhaps 5 metres), in which case the cost would be about $8.7m/track-km. However, culverts are substantially different to beam bridges, so they are unlikely to follow the same cost function. The 2010 Inland Rail Alignment Study gave a cost estimate for box-culvert floodplain crossings of between $220k and $498k each, which works out to $57 million/track-km (assuming each culvert “cell” has an external length of 1m). This surprisingly high cost probably stems from the fact that the cost refers to single installations of only a few metres each; the conversion to a per-kilometre cost is therefore misleading. The same report suggests bridges cost between $25 and $70 million per kilometre. Culverts being so expensive doesn’t make sense; just going on pure economic logic, box culverts must be cheaper than bridges, much cheaper – otherwise you’d just build short-span viaducts instead. An earlier draft version of the same report included a per-kilometre estimate for “floodplain culverts” of 2.4 x 2.4 metres in cross section, of $1.728m/km. This almost seems too cheap after the vastly inflated costs in AECOM13, but the “single cell” estimates are broadly similar to the final report, suggesting the numbers are based on the same underlying estimate. Possibly, the error in converting cost for a single culvert to a cost per kilometre is how AECOM13 arrived at such a high number. These low costs for box culverts are supported by several other sources. Clarence Valley Council installed two large box culverts under a two-lane highway near Lake Woolowayah in 2010 at a cost of $225,000 each. The Arkansas DOT estimates a cost of US$74 per square foot of deck-top area ($797/m2), or $3.186m/km assuming a 4m per-track deck width. A 2001 study by the Australian Rail Track Corporation estimated the cost of pipe culverts at $458,000/km (<0.6m diameter), $916,000/km (>0.6m diameter) and box or arch culverts at $2.29m/km (all costs adapted to 2013 dollars per track-kilometre). A conservative estimate for culvert cost is $2.5 million/track-km for box culverts, and half that ($1.25m/km) for pipe culverts; these numbers are substantially higher than the estimates they are based on, but way, way lower than the assumptions in AECOM13. Infrastructure costs began to escalate wildly beginning about 2004 as the commodity boom drove up the prices of raw materials and trade labour. Given this, how relevant is an empirical cost function based on mostly pre-2004 data? The early 21st century construction boom is most likely going to be a short-lived phenomenon, and there are plenty of signs that it has already concluded, or at least died down a bit. 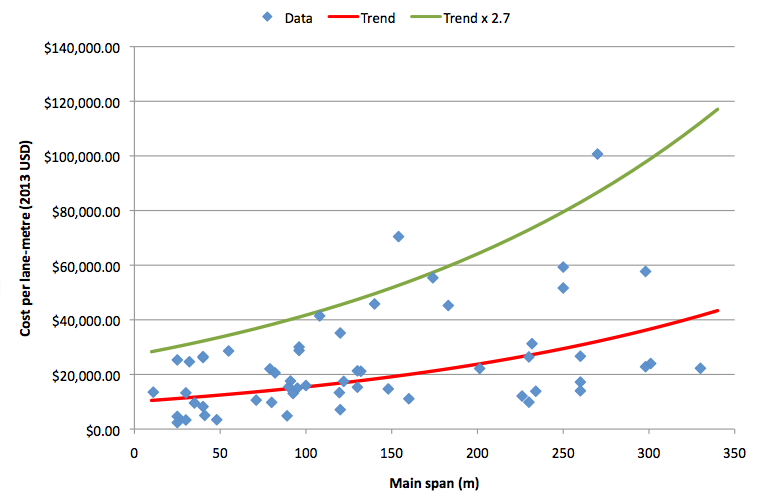 Plotting annual construction cost data from the California Department of Transport for the most common type of concrete bridge shows a pronounced slump in the wake of the Global Financial Crisis. Although costs for longer spans have recovered, it is a strong indication that the data has reverted to the pre-boom trend, or at the very least that the construction boom is a cyclical event that will eventually revert to normal. 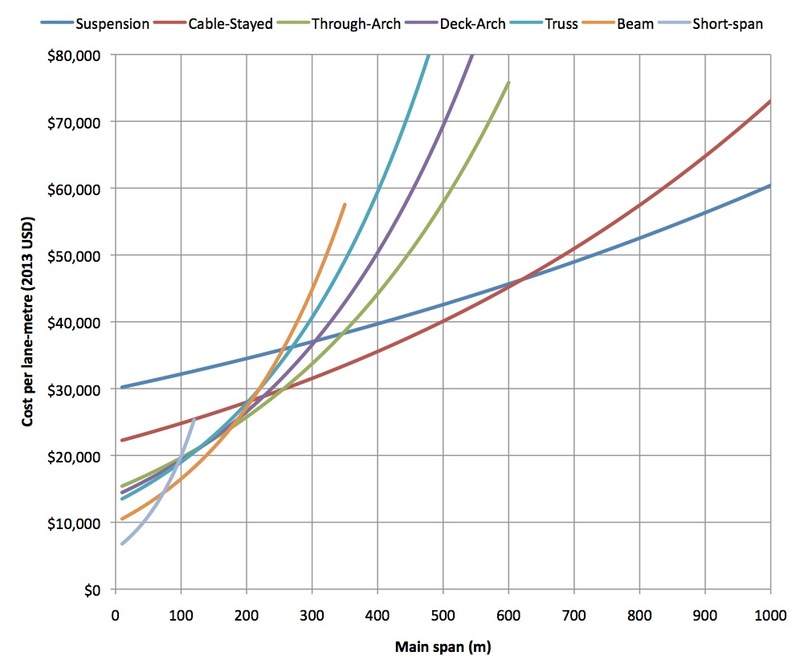 In light of the above data, the below are considered to be conservative costs for standardised bridge types. Where based on cost functions, a multiplier of 1.5 has been applied for rail loading, and 1.35 for Australian construction premiums. Additionally, apply multipliers of 2.35, 1.67 and 1.15 for short-span bridges comprising only one, two, or three spans respectively. This is considered to give substantial contingency to the estimates. Bridges requiring a longer mainspan than 50m will be classed as major bridges, and costed individually using the cost functions (Cost = AeBS) which are presented below including multipliers of 1.5 for rail loading and 1.35 for Australian construction premiums. Note that these cost functions give cost per track-metre; multiply by 2 for dual track, and by 1000 for cost per track-kilometre. I realise that the costs presented in this section are far below the AECOM13 estimates, by as much as 10x in the case of box-culverts, and more than double pretty much everywhere else. While this may well generate debate, I believe the information above presents compelling evidence that AECOM13 is an outlier among a broad range of reliable sources that present lower numbers. The lower cost estimates that Hot Rails will adopt for bridge structures are both verifiable and justifiable. alignment, bridges, cost, cost function, culverts, economics, empirical data, farm crossings. Bookmark.